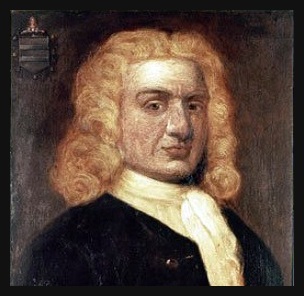 In 1689 William Kidd served on the pirate ship "Blessed William". The ship surrendered at Nevis, an island in the Caribbean. Kidd was given license to attack the French by the governor of Nevis. In December 1689, he participated in the plunder of Marie Galante as well as attacking several French ships. In February 1690, Kidd's crew fearing for their safety in war decided to steal there ship while Kidd was ashore. Kidd was given the "Antigua" and gave chase, chasing the Blessed William to New York. New York at the time was embroiled in a kind of civil war. Kidd allied himself with the winning side and married a wealthy widow in May 1691. He remained at New York for a few years aquainting himself with political leaders. One of those he made aquaintance with was Robert Livingston whom was an ambitious entrepreneur. In 1695, He and Livingston sailed to London where they met with Richard Coote, earl of Bellomont and recently appointed Governor of New York and Massachusetts. Kidd had hopes of securing a privateering license. The three concocted a scheme to capture pirates and keep the booty for themselves instead of returning it to its owners. The three signed a contract in October with Coote staking £ 6,000 for outfitting Kidd in his expedition. ( Coote made several other arrangements secretly that involved the Secretary of State, heads of the Admiralty and Judiciary Courts, and the King himself. ) Kidd was granted three commissions by the king. The first allowed for the capture of French ships, the second allowed for the capture of pirates everywhere, and the third and most important to their cause, the suspension of all captured booty having to go through the courts. This allowed Kidd to keep the loot until time for surrender of booty to Governor Coote in Boston. The three bought the "Adventure Galley", a 300 ton, 34-gun ship. Kidd left England in May, 1696 sailing for New York where he recruited his crew. He promised his crew 60% of all booty even though he had already promised 60% to Coote. In September, He sailed to the Indian Ocean by way of the African coast. He stopped along the way at Madagascar, careening his ship at Johanna Island ( Anjouan ). In April 1697, Kidd left Johanna Island where he sailed for the Red Sea planning to plunder pilgrim ships returning from Mecca to India. He ignored his second commission ( capture of pirates), when the pirates John Hoar and Dirk Chivers were encountered along the way by Kidd at Saint Mary's Island. On August 15th, Kidd encountered an Indian squadron escorted by an East India Company ship. The British ship opened fire on Kidd. Kidd retreated to northwestern India. On the 19th, Kidd seized a small ship near Janjira. He tortured the Indian sailors, and impressed the British captain into acting as pilot for several months. Kidd then continued south, fighting off two Portuguese warships and stopping in September at Laccadive Island for repairs. At Laccadive Island, Kidd's crew forced the inhabitants to work, used their boats for firewood, and raped their women. In November, Kidd encountered another East India Company ship. His crew wanted to attack but Kidd convinced them to let the ship go. About mid-November, they encountered a Dutch ship. It is alleged that William Moore, the Adventure Galley's gunner and Kidd had a dispute over whether to attack the ship or not. Kidd is said to have killed Moore by smashing a bucket over Moore's head. At the beginning of December, Kidd captured the Dutch ship the "Rouparelle". She flew the French flag and had a French letter of marque. He renamed her the "November". In January, 1698 Kidd achieving his most glorious moment in pirate annals by capturing the "Quedah Merchant", an Armenian ship leased to the Indian government. The "Quedah Merchant" was sailing from Bengal to Surat with a rich cargo of muslins, silk, iron, sugar, saltpeter, guns, and gold coins. Kidd sold some of her cargo for £ 10,000. Proceeding south he captured a small Portuguese ship and was unsuccessful in the pursuit of two East India Company ships, the "Dorrill" and "Sedgewick". Kidd landed at Saint Mary's Island in April 1698. Robert Culliford's ship the "Mocha" was anchored at the island. Since Culliford was among those who stole Kidd's ship "Blessed William" in 1690, both Kidd and Culliford were extremely cautious. Kidd was able to quell the apprehension when he reassured the pirates that he was as bad as they were. The crew divided the Quedah Merchant's booty at the isle. Most of Kidd's crew joined Culliford, and Kidd burned the Adventure Galley. He renamed the Quedah Merchant the "Adventure Prize" and left Saint Mary's in November, 1698. The East India Company already suffering at the hands of Henry Every, and now with the loss of the Quedah Merchant had the threat of European expulsion by the Emperor of India to contend with. The company under pressure, compensated the merchants of the goods aboard the Quedah Merchant, paid bribes, and agreed to send patrols to the South Indian Sea. The Indian officials were not placated as pirate attacks continued. The British government, trying to retain their trade interests in India denounced Kidd as a pirate and omitted Kidd's name in a general pardon issued in 1698. An all-out manhunt for Kidd was ordered in November, 1698. In April, 1699 Kidd reached Anguilla in the Caribbean, where he would learn the news after being refused protection by the Danish governor of Saint Thomas. He then went to Mona Island and Savona Bay in Hispaniola where he abandoned the "Adventure Prize" in exchange for a sloop he had purchased. After stopping at New Jersey and Long Island, Kidd went to Boston where he was arrested in July 1699 by Governor Coote. Kidd was expedited to London in 1700. A political scandal broke out with members of opposite parties attacking each other with slander and accusations. Kidd was convicted of the murder of William Moore and piracy in May 1701 as he was too dangerous a witness for the political parties involved. He was sentenced to hang on May 23, 1701. His hanging was not a pretty sight as the rope snapped under Kidd's weight. He then had to be hauled up and hanged a second time. 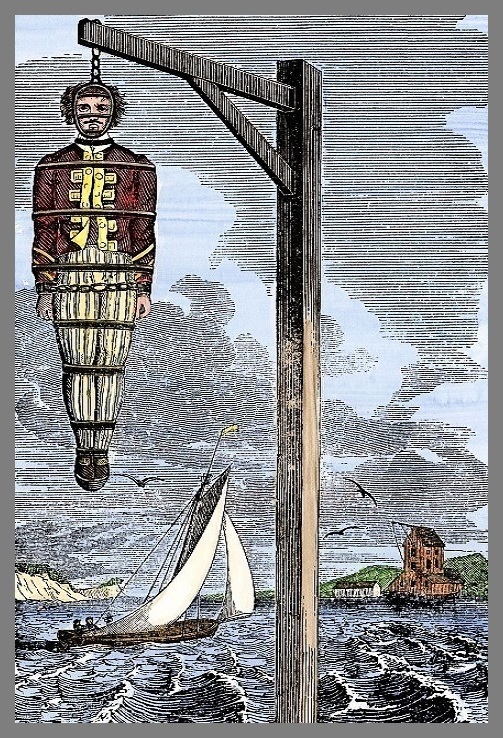 After his death, his body was covered in tar, bound in chains, his head covered with a metal harness, and his body was then left hanging over the River Thames at Tilbury Point as a warning to sailors and all those who would dare think of becoming pirates. Kidd's body remained there for about three years until it was totally rotted away.